Usually when an artist’s work appears in Metropolitan Museum of Art or the Met, it’s a career highlight and an “I’ve made it” moment. Unfortunately for me, this was not the case. A dear friend and former traveling companion, John O’Neill, the Museum’s Publisher and Editor in Chief, passed away almost one year ago. A portrait of John I painted 50 years ago was on display at the memorial service, which was held at the Temple of Dendur. 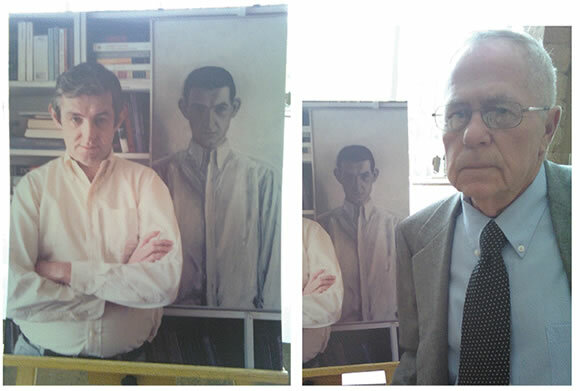 On the left, he is standing in front of the portrait and I am on the right, in front of that same picture at his memorial service. I met John O’Neill in Chicago and we traveled to Europe together for four years. We had a bad accident in Montefiascone, Italy and the people and doctors were very nice to us. We were recuperating for 7 months in the hospital there. John ended up as Director of Museum Publications at the Metropolitan Museum of Art. O’NEILL–John P. The Trustees and staff of The Metropolitan Museum of Art mourn with deep sadness the passing of John O’Neill, the Museum’s Publisher and Editor in Chief. In a career spanning 31 years at the Metropolitan Museum through his retirement in December, he oversaw the publication of more than one thousand exhibition and collection catalogues as well as the quarterly Bulletin, annual Journal, and all the gallery labels accompanying works of art in the Museum. John’s extraordinary commitment to quality raised the standards for museum publishing worldwide, and his passions for art, literature, and above all opera were inspirations to those around him. He was respected and loved by his Museum colleagues and will be greatly missed. We extend our deepest condolences to his entire family. *100 Light Boxes. 10cm x 25cm x 25 cm. Some given away as gifts, the rest burned in the fire.